Julia Gillard's Carbon Tax package has suffered a very critical reception despite extensive compensation for trade-exposed industry and low-middle income households. So how will the tax work to reduce emissions? And what are we to make of charges of 'redistribution' made by Abbott and others? In any case - is 'redistribution' such a bad thing? 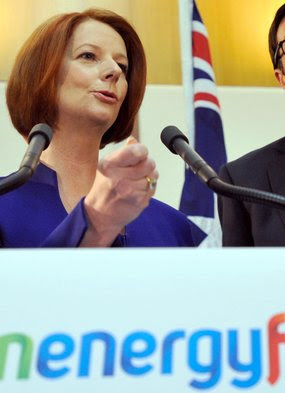 In the face of an almost all-pervasive fear campaign, what is the truth concerning Gillard Labor’s carbon tax? How will it really be implemented? Who will it affect – and how? Can it succeed in its object of restructuring the economy? Does it involve elements of economic redistribution; and if it does, is that necessarily a bad thing? Some of this compensation will be provided for by a restructuring of the tax system. For instance; the tax-free threshold will be “more than trebled to $18,200”. And individual pensioners will receive compensation of up to $338 a year; with up to $510 for couples. The most intensely affected areas of the economy will be energy generation and distribution. In assessing the government’s policy it is best to respond to the claims of critics directly. But to begin we should first return to basics: and that is recognising the virtual consensus in the global scientific community that global warming is real, and that carbon emissions by human beings contributes to this. So to what extent will the carbon tax and associated programs add up to a reduction in emissions? Businesses will seek energy-saving measures, while households will do likewise – and also consider investment in renewable energy. Indeed, there could well be a boom in the micro-renewable energy sector. Overwhelmingly this will occur without financial pain for middle and low income households - as with compensation the main aim is to provide the market with a ‘price signal’ and not to raise revenue. This is absolutely crucial because Tony Abbott has committed to expensive forms of “direct action” on climate change running into billions and billions - which would be paid for through savings elsewhere in the Budget. Refusing to submit his proposals to Treasury for costing, Abbott must nonetheless be aware that his proposed initiatives could not be funded simply through “efficiencies”. They would inevitably involve austerity measures. Perhaps these would apply in health and education; or perhaps through further privatisation of roads and imposition of flat ‘user-pays’ tolls - for which working class Australians would pay. So before we even begin to address accusations of “socialist redistribution” we need to observe that price signals and direct intervention will make significant inroads into Australia’s carbon emissions, and as such is well-justified on environmental grounds alone. That said, however, Abbott and right-populist elements of the media are raising alarm at the prospect of even mild redistribution via the chosen structures for compensation via direct payments and restructure of the tax system. Like several previous articles in the ‘Herald-Sun’ accusing Gillard Labor of ‘Class War’, these articles attempted at the same time to portray higher income groups as ‘average working Australians’ being ‘punished’ for effort. Indeed the term ‘Sparkie’ could be interpreted as a colloquialism inferring working class status. But both the households considered in the Herald-Sun articles concerned would occupy a position in at least the top 20% of household incomes. A single-income household with one income-earner bringing in a $150,000/year income would not be considered by most as ‘working class’ – colloquialisms aside. Indeed, in this day and age few households servicing a mortgage and raising a family can afford for one partner to remain at home. This raises the question that if action must be taken on climate change, how should we balance the burden? The principle concerned could also be extended to other necessities: for instance, provision of health care, education, aged care, social housing, welfare and infrastructure. Many Australians work hard for comparatively little return compared to the Herald-Sun’s chosen examples. There are some dual-income households – with members employed in cleaning, retail, childcare, hospitality, textiles, and manufacturing – who bring in barely $50,000 before tax. To speak of ‘punishment for effort’ for higher income households, and yet to prefer putting a disproportionate burden upon these families - would be revealing of the priorities and values of those concerned. In the labour market scarce skills usually bring in greater return, but many of these lower income individuals and households work under unpleasant and alienating circumstances – and with sometimes inconvenient or onerous hours. In Australia, also, there is a recent history of falling minimum wages being compounded by housing market stress, past regressive restructure of tax, and increased energy costs as a consequence of privatisation. It is not at all radical – or necessarily ‘socialist’ – to support a degree of redistribution to compensate those Australian workers and pensioners affected by these trends. And while there has to be reward to give incentive for workers to acquire skills, other ‘middle income’, ‘average’ individuals and households also deserve a ‘fair go’. A worker on a wage of, say, $50,000/year should not be paying the same kind of tax as a worker on $150,000/year. Under circumstances where both workers were applying themselves with comparable levels of effort and effective sacrifice, skill differentials alone do not justify massive discrepancies in income. A progressive taxation system is therefore well justified in moderating discrepancies of income which are unjust, and ensuring universal access to social necessities . And the tax system more broadly is justified in providing best-value ‘collective consumption’ of essential social services from which most Australians benefit. Again: whether we speak of health, education, aged care, social security, social housing or other infrastructure – often these are provided more fairly and more efficiently via the ‘social wage’ than would be the case if ‘left to the market’. Such principles have historically been acceptable to a variety of ideological perspectives – whether we speak, here, of liberalism, or of social democracy, or indeed of socialism. It is only at the extremes propagated by the likes of Hayek and Rand – that the principles of progressive taxation, the welfare state and the social wage – have been rejected sweepingly. But such is the ideology which ‘has a grip’ on some parts of the Liberal Party of Australia today. It is an ideology which threatens the ‘Americanisation’ of Australian society, with greater extremes of poverty, and a lack of basic social solidarity. And it is an ideology that needs to be criticised explicitly by Labor. All this said, there are dangers for Labor. In regions such as the LaTrobe Valley in Victoria there are well-grounded fears that the shift to renewable energy will ultimately cost jobs in coal-fired energy, and as a consequent will destroy many ‘flow on’ jobs which use that industry as their economic base. Hazelwood power station is very likely to find its operations scaled back. According to ‘The Age’ Greg Combet has announced that the LaTrobe Valley alone will receive “a $200 million package over seven years for ''strongly affected'' regions, with help in training and diversifying.” But in the same article Electrical Trades Union state secretary Dean Mighell is quoted as arguing more needs to be done to create local jobs. This begs the question of whether government ought ‘get its hands dirty’ with more direct industry policies – reforging the ‘economic base’ in the LaTrobe valley and other affected regions – which would ‘flow on’ in maintaining thousands of other ‘peripheral’ jobs. And in another concern, the Financial Review has reported an impending $4 billion ‘budget toll’ over the next four years in order to pay for industry and household compensation. Labor is flagging its intent to make ‘savings’ in order to reach its projected surplus for 2013, but had already been struggling to find savings for 2011-12 without impacting on crucial programs and initiatives. Between now and the next Federal Budget, therefore, progressive forces across the factional divide in Labor need to build momentum behind an alternative response for the government to this shortfall. Importantly, Labor has the choice of revising its party platform in December to open the way for a moderately increased tax take as a proportion of GDP. Such a decision could be followed with modest tax reform to the extent necessary to avoid austerity, or to the extent necessary to fund a bold package of initiatives addressing what is seen in this country as a ‘cost of living crisis.’ This would also attract the charge of ‘redistribution’, but there is the potential that by improving the circumstances of average Australian families this is a debate Labor could well win. Indeed, that could properly be the object of an article in of itself. A ‘National Disability Insurance Scheme’ is another potential choice for Labor in seizing the initiative and delivering on a reform agenda – but would also need to be backed by tax reform and increased revenue. That would be another reform Abbott would find very difficult to undo. One option in this context could be a 1 per cent increase in Company Tax – which would still leave Australia way short of Company Tax rates in the United States. Another option could be a modest reduction in dividend imputation to 75%. In conclusion, Labor has a long way to go in convincing voters of the merits of this carbon tax package. What is interesting is that Gillard’s carbon tax package is very similar in its dimensions to the earlier proposed Emissions Trading Scheme. But what is notably different is the word ‘tax’. The fear campaign spread in the right-populist monopoly media has found its mark. And many Australians are angry that Gillard is exceeding her mandate in this way – despite the fact she has had no choice in the context of minority government. This will only change once the package is implemented and most people see for themselves they are no worse off. Most Australians will only pay with the costs of structural adjustment being passed on over the very long term. We talk here of large-scale future investment in renewable energy. But the same could be said with Abbott’s ‘direct action’ – where the costs of industry adjustment could be paid for with direct subsidies from tax-payers: paid for via sweeping austerity. And yet we all should be willing to make small sacrifices in fighting climate change – for the sake of our planet, and for the sake of our children. If all comparable nations also refused to take action the effect would be to cripple the global movement to address this crisis. But by putting implementation off until mid-next year Labor is giving time for fear and anger to fester. All those political, environmental, industrial and social movements which support the policy therefore need to begin a mobilisation immediately if the situation is to be saved. An information campaign involving all these movements needs to begin, even including advertisements and letter-boxing – as surely as if the election were this year. Someone just asked at ‘Left Focus’ whether or not Abbott is a fascist…. Well in response - Abbott lacks the commitment to corporatism you'd expect of fascism, and his nationalism isn't at the point of being 'virulently extreme.' Though he is definitely socially conservative. He says in his book 'Battlelines' that he believes in solidarity with those 'doing it tough'; But the Liberals' response to carbon tax compensation stretches his credibility with regards to that statement. The question was also raised how Abbott is getting so much ‘traction’ on this issue. Again – in response - Abbott is getting 'traction' because much of the media is running a cynical psychological campaign on themes like 'class war' and 'aspiration'; They're trying to make the average worker identify with other 'working class Australians' on $150,000/year, while playing on resentment of the vulnerable - those on welfare and the unemployed. It is very deliberate; and it is extremely cyncial. And yes - it is working. There's a debate at 'En Passant' on the Carbon Tax; with a very critical perspective from the Left; I responded there but unfortunately the post doesn't seem to be showing yet; I'd welcome debate both here and there! It's good policy. no one with a brain who looks at the details themselves can say otherwise.